A stranger enters the pridelands, looking for help. He encounters the Lion Guard and ask them a big favor. Kion and his friends are needed outside of the Pridelands. 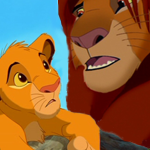 Simba forbids the Lion Guard to leave the Pridelands, since they are needed there, but Kion refuses to let the foreigners in need out of help. Kion knows a solution and with some friends, they go on a great adventure to the far away Kingdom of Hope. But to get here, they have to cross four kingdoms that are lead by lions and other creatures. They will have adventures, encounter new friends and enemies. Will Kions quest to save the Kingdom of Hope succeed? Very early in the morning, before dawn, Simba and Nala wake up. Kion and Kiara are still asleep in the lions den with the lionesses of the pride. "morning, my king" Nala smiles. He smiles: "morning queen, this is the day we have been waiting for, for a long time!" "a day with no duties, together. Kiara will join Kion with his Lion Guard patrol over the pridelands. And the afternoon we spend with the four of us: we and the cubs. A nice thing to look forward to!" Nala sighs. "Royalty comes with great responsibility. I am thankfull that Rafiki and Zazu keep watch here at Pride Rock. They are true friends. And I am thankfull for this special day off!" "Oh, Nala, me too. I could use a break and spend a day with my loved ones, you know?" Simba and Nala purr and watch the sun climbing up in the far horizon, behind the shades of the far away mountains, that are the boundaries of their kingdom. Behind them, they hear a cub jawning. "majesty?" Zuri stretches and decides to sit next to Nala. "Zuri! Good morning dear, you are up early. Is your mom still asleep?" Nala asks. "Yes, Queen Nala, she is always one of the latest to wake up.. I want to join you today.. on your day off.. can I?" "No..not today, but any other day you are very welcome to go with us. Today we have something special planned, family moments, we don't spend much of them together.."
"No problem my Queen!" Zuri rans off. "Call me Nala please, dear.. Queen is so.. We are almost family.."
"Okay, Nala!" A happy Zuri jumps right into the group of sleeping lionesses, waking some of them. At the far end of the kingdom, behind the mountains where the sun came up, someone didn't sleep at all. Tirbur, a black leopard, is climbing and searching a way trough the big rocks that form a mountain wall. He is at the west boundary of the Pride Lands with an important mission. "argh, almost there.. I wish Father could see me now.. he would be proud that I made it all by myself, this long, devastating journey.."
Finally Tirbur finds a passing through, climbs over the final rock formation and slides to the Pridelands side of the mountain. The rocks are slippery and Tirbur has his claws extracted. "made it, yes!" he cheers at himself. He climbs to the lower end of a rock formation, jumps off and sighs. "well, almost at my destination, now I have to take a little break.. must find myself a tree to rest in." Tirbur climbs in the nearest baobab and falls asleep. Meanwhile, at Pride Rock, Kion and Kiara have woken up. Simba and Nala tell them their plan for today. "Kiara will go with you, Kion. She will join the Lion Guard for one day, keep her safe." "Why do I have to go with Kion? I had plans with Zuri and Tiifu, to play at the Waterhole!" Kiara protests. "You may be queen, but I think you will treat your little brother a bit more respectfull if you saw what he and his Guard do, keeping the Circle of Life in balance. That balance is important, and you may learn a thing or two about responsibility. Treat your brother and the Guard members with respect. We have a surprise for you both in the afternoon"
Simba nods to show his cubs he is done with his little speech. Little later, the Guard assembles at the Lair of the Lion Guard. "so fun you are coming with us today, Kiara!" Bunga bounces in. "can I sit on your back?" "no" Kiara and Kion say at the same time. Bunga shrugs, greets the other members, and they wander off for their morning round in the Kingdom. Most of the animals in the kingdom have started to wake up, stretching, greeting the Guard and wandering for their eating spots. "Ono, did you see something unusual already?" Fuli asks. "what does that word mean?" Kiara asks. Fuli smiles. "If we only knew.." Their eyes follow the egret flying away. A few minutes later, Ono returns. "I spotted a leopard in a tree! A black one, he is not from the Pridelands. Follow me!" The Guard and Kiara run off, following Ono. Tirbur the leopard is woken up by a lot of noise under the tree. "hey, you! get down here!" Tirbur jumps off the branch and lands on his four feet. "egret..badger..leopard..hippo. and two lions. what a combo! nice to meet ya!" "why are you here?" Fuli continues. "woah.. wait my friends.. let me introduce myself.."
"you are not from the Pridelands, you are a predator and not welcome here, so get off!" Bunga begins. "No, Bunga, let him speak!" Kion interrupts his friend. Then Tirbur begins to tell his story. "I traveled a long way to get here. I am here to ask for your help. The Pridelands are the only Kingdom that have a Lion Guard, and a respected balance between the animals in the kingdom.."
"that is the Circle of Life, and we respect it to keep order and safety for all animals" Kion answers. Kiara nodds. "our father, king Simba, tought us that." "I know your father, Kion. I never met him, but his name is known in the land I came from. I am from the Kingdom of Hope. It is far away and in need of help. Good, organized help. I escaped from a horrible reign, with my sister Micah and my father. My father didn't survive, we encountered a large group of hyenas and while he fought them, we had no choice but to run off. He wanted it that way, he told us to.." Tirburs face turns sad. "that is sad. But I think he'd be happy to see you made it here.. what happened to your sister, Micah?" Fuli asks. "She was very tired, and got her paw hurt during the fight with the hyenas. She found shelter in a cave nearby, at the other side of that mountain formation. "that is the land of Wonders, that is a safe place!" Beshte smiles. "it has that name because of the rare and beautifull flowers that grow there!" Bunga knows.
" your sis will be safe there, don't worry!" Fuli says. "not so safe.. the hyenas.. we encountered them a few miles from that place. And that is also in the Land of Wonders. I came to the Pridelands for help. You need to come with me. And I'll explain where your help is needed." Tirbur sighs. "but you are young. Your parents need to know where you are." "Tirbur, I would really want to help you. but when we leave.. the Pridelands are left without a Lion Guard. And our parents have something important, a surprise!" Kion answers. "Kion, I will go back to Pride Rock and ask if mom and dad will come with us!" "we have little time. can that honeybadger go, and tell your parents that we are gone? and that it is a life saving mission?" "the name is Bunga.. and don't we get to say goodbye to our families?" Bunga smuggles. "what family?" Fuli smiles. "this leopard needs us. we will join him and make his home safe. how long can it take? we'll be back by noon!" Tirbur thinks again. They will never be back by noon. This journey will take days. But time is important. His sister and his family are in danger and he needs the Lion Guard. "It only takes a few hours, my friends. I'll keep you all safe and bring you to your parents afterwards"
Bunga runs off to tell Simba they are leaving. Tirbur is glad to have the foul-mouthed badger gone. "you can wait for him.. or stay here. this trip involves climbing. you're a hippo my dear friend"
"I will go with Bunga then, and see you all by noon. stay safe!" Bunga is already out of sight and Beshte follows his lead. Kion, Kiara, Fuli and Ono follow Tirbur. They approach the mountain that is the west border of the Pridelands. The princess and her little brother are about to leave their kingdom. Zuri and Tiifu are chatting at the top of Pride Rock. "I'm wondering what Simba and Nala have planned this afternoon, I'm totally curious!" Zuri giggles. well (beeep) that, I will continue because I like writing for myself, and opinions mean very, very little to me. A few days passed, and Kion, Fuli and Tirbur are halfway crossing the Land of Wonders. Since then, they have fought the hyenas off, and the sister of Tirbur has joined their little group. She is a leopard, like Tirbur, but instead of black, she is the normal leopard colours, but a bit more pale, like Nala's main fur and then with greyish-brown spots. She is quiet and Kion wonders what is about this sister of Tirbur. "Guys, we need a break. I see a water fall, and a little green oasis. We can refresh ourselves there" Kion shouts to his fellow travelers. Ono flies along and lands on a rock. That is a good Idea Kion. Tirbur gathers them, behind the waterfall. "time for a plan, if you come along with me. You are all very helpfull, and you deserve to know what you're in for"
"Going to save your kingdom, right?" Fuli snickers. "It is dangerous and we need a good, solid plan!" Tirbur snarls. "no jokes, no distractions. We have to stick together, as a group we stand strong and back up each other if we get attacked"
Kion stands up. "We are the Lion Guard, well, a part of it. And we have the lead in this. You can trust us, but you have to let us lead this mission" Kion explains. Tirbur nodds. "I have no choice, I apologise." "It's okay" Fuli smiles. "but don't go bossy on me again!" With her tail up in the air and a vaust attitude, Fuli removes herself from the crowd to snooze on a tree branch. "Since last morning, we had little sleep, a hyena fight and a lot of miles behind us" Kion tells Tirbur. "Tonight we rest here. Tomorrow we will continue our travel towards your land, the land of Hope"
"Fine, I'm very tired as well" Tirbur agrees. "how about you, sister?" "I have a name" she replies. "well, what is your name, then?" Ono asks. "Not funny, Ono" Canatha turns around and walks towards Fuli. "sorry.." Ono shrugs. Leopards seem a bit pointy to him. At pride rock, Simba is panicking. "I need to get my son and his friends back here"
The family gathering has exploded, since Kion and half of the Guard ran off. It was a good thing Beshte and Bunga came to the cave to inform their king about his sons adventurous kerbabble. Nala points out Kiara. "Kiara, get Tiifu and Zuri. We need lionesses on our trip." Kiara runs off to get them. A few minutes later, Kiara returns with Tiifu and Zuri. "we are ready, let's go!" Simba, Nala and the three lioness cubs walk off priderock, leaving Rafiki in charge of it. Zazu stays home as well. Zazu decides that he, Bunga and Beshte have to play for "Lion Guard" during the abstinence of Kion, Ono and Fuli. It is a long trip, but they will soon meet up with the little travel group that's resting at the oasis, gazing at the stars since it is evening and it is getting dark. "wow, look at the dark skies, filled with stars!" Canatha sighs. Tirbur nodds. "my dad loved to gaze at them with us" he explains Kion. "stargazing, it is a thing in my family too!" Kion smiles. In quietness they point out the star patterns and try to figure out the great Kings of the Past, but that becomes difficult when they hear a moaning sound. It comes from the bushes. When they arrive there, they see a beautifull white creature. "are you a zebra?" Fuli asks the animal. "but I see no stripes?" "I am kind of a horse, a hurt one" the animal answers. "Fuli, it is a rhino-horse" Ono states, pointing at the horn on top of the white horse's forehead. "no, that is a Unicorn, my friends!" Tirbur smiles. "This is the land of Wonder, and this Unicorn lives here!" The friends heal the wounds of the unicorn, and invite him to join on their trip. "that is a good reason to travel, I will help you save Tirbur and Canatha's land!" "Cuulthu" the friendly unicorn answers. "well, welcome to our group, Cuulthu!" Fuli and Ono smile. After a bit more stargazing, they travel off to the land of Moon Rocks, they decide not to sleep, all are too excited after the unicorn incident. What a great and miraculous friend to have. Kion and his fellows do not know they are followed by Simba, Nala, Kiara, Tiifu and Zuri. If they only payed attention, they could hear them sneak behind the bushes after them.